This temple of tone is the result of Aaron shooting out a mountain of pedals, followed by more test listening at Nice Rack Canada. Among the giants that have come to call this pedalboard home are; Friedman BE-OD, Walrus Audio Deep Six & Messner, Wampler Pedals Ego Compressor & Tumnus, Empress Effects Para Eq, Jim Dunlop EchoPlex Delay and the Strymon “Big 3” Mobius, TimeLine & BigSky plus a Riverside drive. The RJM Music MasterMind PBC was the switcher / controller choice after much deliberation. To expand the functionality of the system an RJM Music Mini Effect Gizmo is in use. The PBC & MEG switch the audio path and the PBC provides MIDI control over the “Stryfecta” of effects. The PBC is in turn controlled by the artist’s show computer that also sync’s lighting cues. 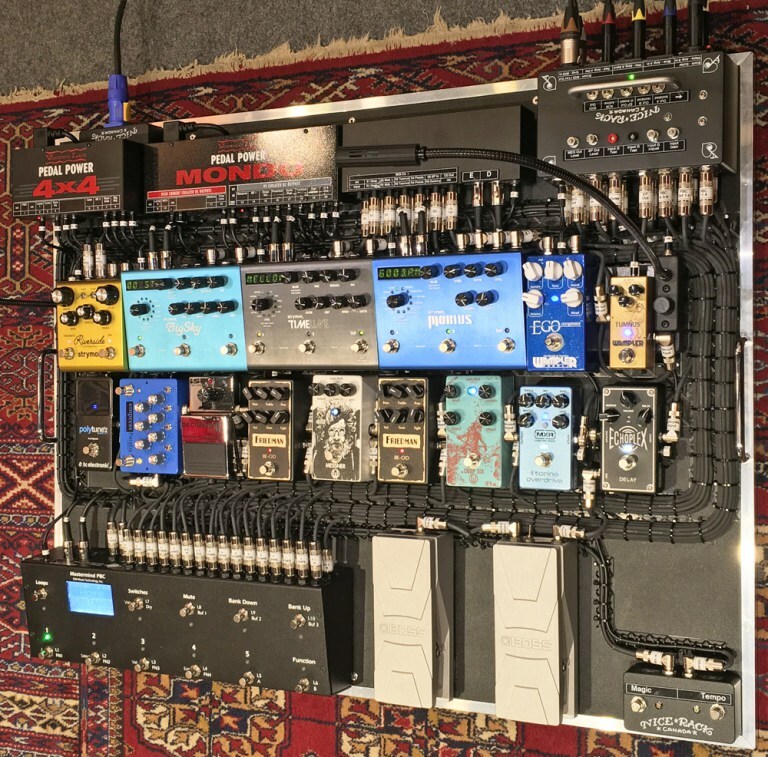 After programming is complete for a tour, the player has no need to physically interact with the board. The artist is freed from remembering switching cues allowing them to focus on accuracy of performance & expression. The system is powered by 2 of our favorite power supplies, the Voodoo Lab Pedal Power 4×4 & Mondo. The Boss FV30 volume pedals have both been modified. One has become an expression pedal connected to the PBC and assigned per preset to a unique function or functions in the system. The second has been modified to include a switchable Treble Bleed circuit for a more even frequency response across the entire sweep of the pedal. Bring us your tone fantasies and touring realities, we’ll combine them into a system build beyond your imagination.